Making sure that your tyres are correctly inflated is key to not only prolonging the life of your tyres but also helps to reduce fuel consumption and CO2 emissions. Although there are plenty of garages and petrol stations that supply air pressure checking and filling facilities, you can often find that you have to queue or that the pumps are out of order by the time you have driven there. To combat this problem there are now a wide range portable air pressure gauges and pumps on the market, but how do you choose which device is the best for you. The Rapid Tyre Inflator from Michelin is just one of the options from their range of digital and analogue portable tyre inflators. It comes with a backlit digital readout which measures in both PSI and BAR, LED lights for easy use at night and all the connectors and adapters that you will need to inflate not only your tyres, but also a wide range of other inflatables including balls and toys. The inflator is quick and easy to use and will inflate a tyre from flat to full in under 3 minutes and comes with a detachable backlit pressure gauge for quick and easy checking. It is small for easy storage and comes with a 12v vehicle electrics adapter allowing you to run it from your vehicle wherever you are without the need for mains power. Michelin is synonymous with tyres being one of the largest manufactures of tyres in the world. The French based manufacturer established in 1889 continually leads the fields in its tyre products for road vehicles and also its heritage in motorsport. Their recently developments in tyres has been to improve the fuel efficiently of cars which has drawn upon all their experience and knowledge. 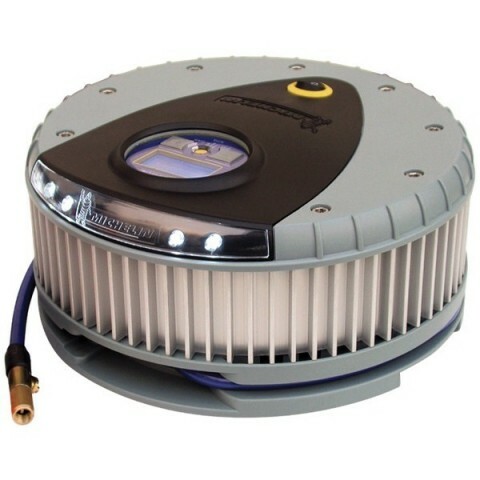 The Rapid Tyre Inflator from Michelin is just one of the options from their range of digital and analogue portable tyre inflators. It comes with a backlit digital readout which measures in both PSI and BAR, LED lights for easy use at night and all the connectors and adapters that you will need to inflate not only your tyres, but also a wide range of other inflatables including balls and toys. The inflator is quick and easy to use and will inflate a tyre from flat to full in under 3 minutes and comes with a detachable backlit pressure gauge for quick and easy checking. It is small for easy storage and comes with a 12v vehicle electrics adapter allowing you to run it from your vehicle wherever you are without the need for mains power.